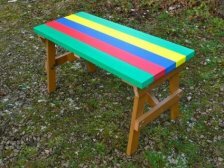 Children's version of our Thames Garden Table in Recycled Plastic Wood. Will never rot. UV protected to highest level against fading. Does not warp, crack or splinter. Buy matching Kids Thames Chairs. 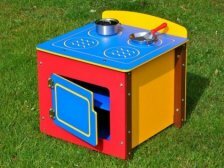 Childs Play Cooker Single Unit - 4 ring with oven in robust brightly coloured recycled plastic. 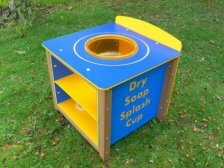 This Recycled Plastic Children's Play Washing Machine single unit will not rot or warp. Can be easily cleaned. Very Colourful. 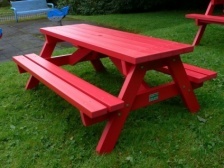 A simple to assemble Circular Children's Picnic Bench made from HDPE 80% recycled and 100% recyclable in Red/yellow or Blue/Yellow. Hygienic and easy to wipe clean - Zero maintenance. For all year round outdoor use. 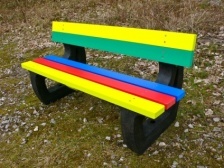 A junior bench in maintenance free recycled plastic made to attract children using colour. A high-quality long-life product and a great investment. 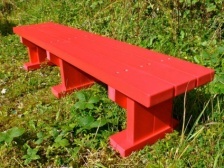 Will not rot, perfect for child friendly environments. Will still be there decades after all the wooden benches have rotted away. Available in Red, Blue, Green, Yellow and Multicoloured. The Derwent all colour range is named after the River Derwent in the Lake District. 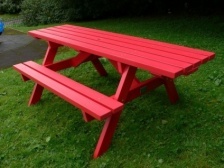 This bright, all colour junior picnic table is made from recycled densely formed polystyrene wood, and will never rot. Its bright colour is energising and attractive, and looks and feels like stained wood. Maintenance free for life. 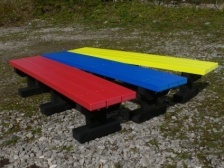 Available in Red, Blue, Green, Yellow and Multicoloured. Available in Red, Blue, Green, Yellow and Multicoloured. 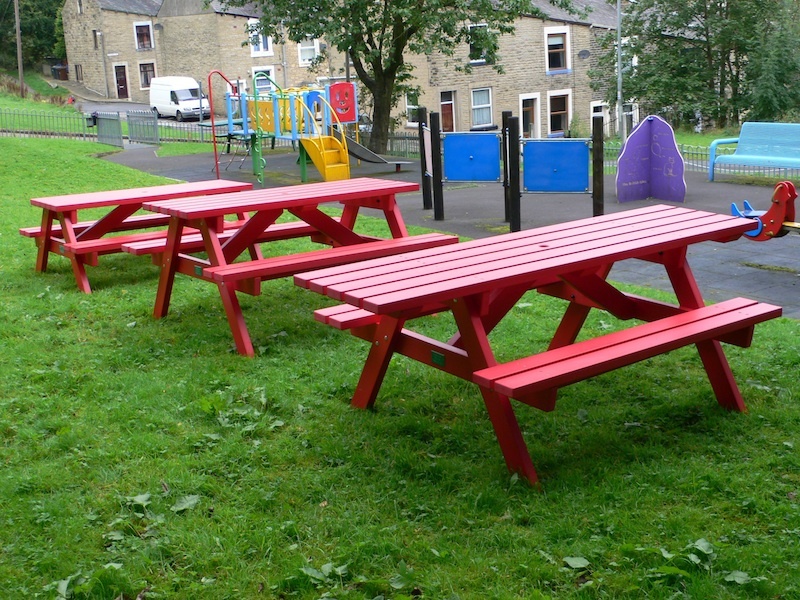 Made from 100% crushed CD cases, these Derwent Recycled Plastic Picnic tables will never rot, crack, warp or splinter and can withstand outdoor environments that are regularly subjected to harsh weather conditions. Their appearance will stay the same throughout the years, making them far more cost effective than wood. This is a beautiful product that will last a lifetime. 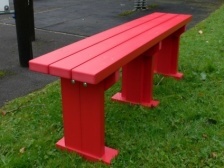 A simple, robust outdoor bench for school playgrounds, recreational areas,community play areas or a private garden. Anywhere children sit or play. Will never rot and lasts for generations. Recycled plastic throughout. 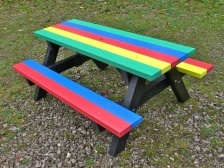 A fun looking multicoloured picnic bench specifically made for children and their friends to enjoy. 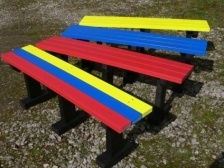 Available in Red, Blue, Green, Yellow and Multicolours. 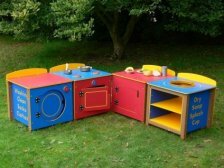 The complete set of Kitchenphonics Play Kitchen Units - for Playing AND Learning at the same time - Recycled Plastic UK sourced - no maintenance bills or replacement costs. These units do not rot and will last for generations of children. 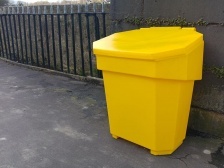 Designed in accordance with ROSPA guidelines. 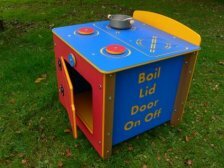 This Outdoor or Indoor Play Cooker contains realistic features and like all our Kitchenphonics range has 8 kitchen, in this case cooker, related words etched onto its side panels. 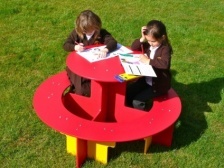 Designed to stimulate role play and can also be used as a Phonics teaching aid. 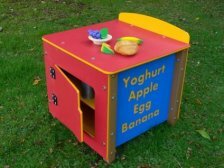 Kitchenphonics Play Kitchen Fridge Unit - A teaching aid as well as a role play product - 8 food related words etched into each side panel. Made from two types of recycled plastic sourced in the UK. 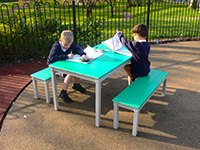 Can remain outdoors in all seasons and all weathers. 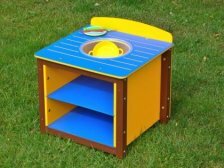 Play Kitchen Sink Unit from Kedel's Kitchenphonics Range - one of a collection of 4 kitchen units with 8 phonics words on the side panels of each unit. 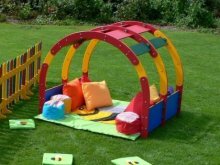 Made for little hands and minds for outdoor or indoor role play. Brightly coloured fun and educational too. Recycled Plastic and recyclable. 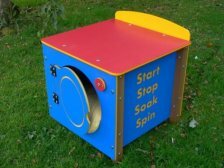 Kitchenphonics Kitchen Play Washing Machine - a washer to learn from as well as play with - 8 washing related words etched into the side panels - eco-friendly too in 100% British Recycled Plastic. 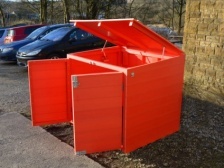 For outdoor use in all weathers and all seasons as well as indoors. 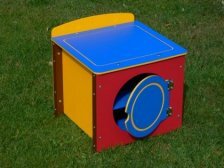 Lockable tool or toy shed storage container made entirely from synthetic wood tongue and groove boards. Made out of recycled CD and contact lense cases. Never needs painting and will never rot. Available in a choice of colours or multicoloured. 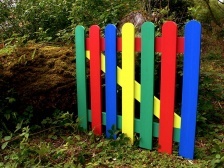 Multicoloured Coloured Gate to match our Multicoloured Plastic Wood Fencing. Constructed using matching flat or round top pales and Z frame back. Brightly coloured and highest level of UV protection - minimal fading over time. A brightly coloured planter for young gardeners, at a sensible height for those with trouble bending but like to garden. Ideal for special needs - wheelchair height or just in case you prefer your garden a little bit higher. 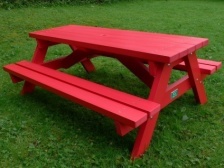 Made from plastic wood, but will never rot or need painting. UV protected colours to reduce fading in direct sunlight. Will still be looking good when all the wooden planters are long gone. 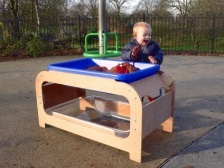 Perfect for nurseries and early years education. 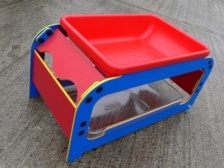 The Perfect Sand and Water Tray - with hand recess for portability - made from recycled British sourced plastic and as it never needs maintenance, will last almost indefinitely. Colours are UV protected against fading. 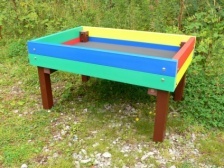 This Sand and Water Tray is identical to the recycled plastic version except the frame is made from marine plywood - still highly resistant to water and frost. Hand recesses at each end allow portability even when full of sand or water. 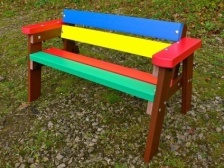 We call it Rainbow Furniture because it's available in UV stable, bright, attractive colours, that appeal to children because it makes everything feel like play. 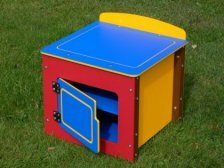 School Furniture that children can play with and yet has an educational element is, as any teacher will tell you, an excellent teaching aid. 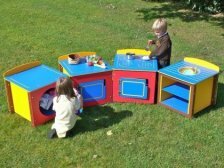 Some designs in our rainbow range have special educational value for learning to recognise words and associate them with particular activities, such as the Kitchenphonic Range of Outdoor Kitchen Units. These proved so popular with the children during the product photo shoot, that it was difficult to persuade them to leave their kitchen play and try any of the other products to be photographed that day. As you can see on the right, both sides of these maintenance free kitchen units have appropriate words related to that unit's use etched into the side panels. These colours will not fade appreciably over the life of the product even if left outside in direct sunlight for long periods. The UV protection is 7 or 8 where 8 is the highest value available. 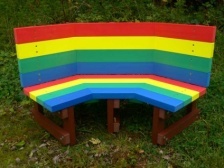 All our rainbow furniture is intended to last for decades, is robust, will never rot, is shunned by insects and mould will not adhere. Graffiti can be wiped off with normal household cleaning materials or WD40. They are non absorbent and therefore very hygienic, and their are no splinters for little fingers. 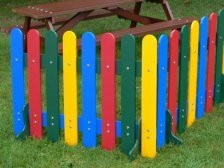 The play dens, seats, picnic tables and benches can be wiped dry with a towel after rain and used immediately without fear of damp bottoms. 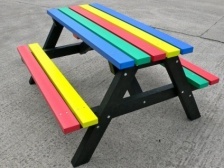 You can order direct from us on this website, or if you have questions about any of our recycled plastic rainbow furniture or special requests for bespoke items, please give us a call on 01282 861325, e-mail or fill out our enquiry form for a quick response.